* Writes MP3/OGG/WMA/WAV/AC3 and other audio files On-the-Fly as an audio disc. * Write Audio CDs, which can be played in all CD players - at home or in the car. 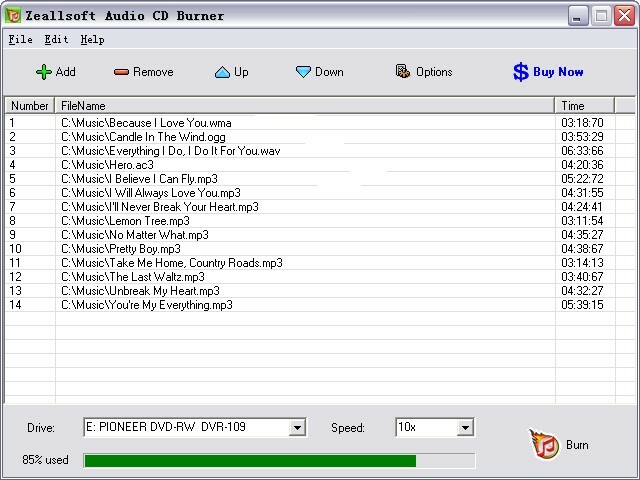 * Write Audio CDs on the highest speed supported by you recorder - Audio CD Burner compatible with CAV, Zone-CLV recorders. * Supports most IDE,USB,IEEE1384,SCSI CD wrirters. * Simple, easy to use interface for day-to-day operation. * 100% Windows XP and Vista compatible. Qweas is providing links to Zeallsoft Audio CD Burner 5.53 as a courtesy, and makes no representations regarding Zeallsoft Audio CD Burner or any other applications or any information related thereto. Any questions, complaints or claims regarding this application Zeallsoft Audio CD Burner 5.53 must be directed to the appropriate software vendor. You may click the publisher link of Zeallsoft Audio CD Burner on the top of this page to get more details about the vendor.